Tomorrow, September 30th, is Orange Shirt Day. In schools, we will commemorate this day on Monday by donning orange and discussing with our students what it means. “Orange Shirt Day” recalls the beautiful, brand-new, bright-orange shirt that was taken away from Phyllis Webstad at age six, on her first day at Mission Residential School in 1973. 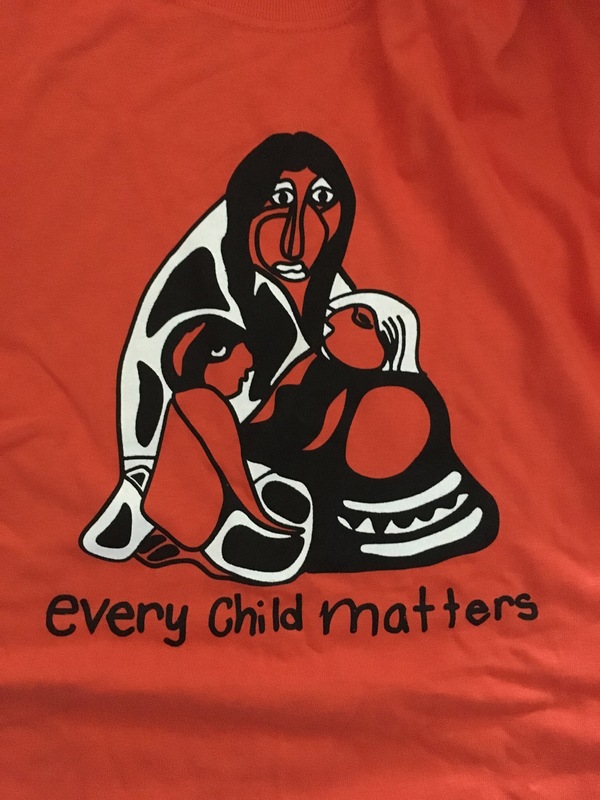 This year’s official orange shirt – art by Janet Cromarty of Kasabonika First Nation, writing by Scarlett Verbeek of Grindrod Elementary School. My daughter also happens to turn six tomorrow. She, like Phyllis, was proud to be starting grade school this year, being in Grade 1 – and also with a carefully-chosen outfit. I walked her to school through our own pretty neighbourhood, to a school that is full of compassionate educators who work hard to create welcoming classrooms, and to teach inclusion and character development. She had a complete nutritious lunch and a nice jacket for the chilly weather. When she got home that day, she declared: “I LOVE Grade One!! I try to imagine taking my child – or being forced to let her go – to a school far away, where I won’t see her for many months. Or even years. I try to imagine her staying at that place where she is underfed, underclothed, expected to speak a language she doesn’t know, made to do manual labour, punished frequently and physically, and forbidden to speak to or even acknowledge her brother. And can’t see her parents at all. It is too awful to contemplate for long. I often think about this, especially since visiting the Mohawk Institute Residential School and having the privilege of hearing survivors speak about their experiences. It’s a chilly, forbidding place. Thousands of children learned misery between its walls. Warm like your mama’s arm. from their faraway numbered beds. Thanks for reading today. You can learn more at Where Are The Children and We Were So Far Away. You might consider donating to Indspire. And if you haven’t watched/listened to The Secret Path yet… although Gord Downie was not an indigenous voice, this work is a valuable access point for those who understand best through music. And of course – please consider wearing an orange shirt on Orange Shirt Day.